DC Residents Voted for One Fair Wage. DC Council Should Not Overrule Them. 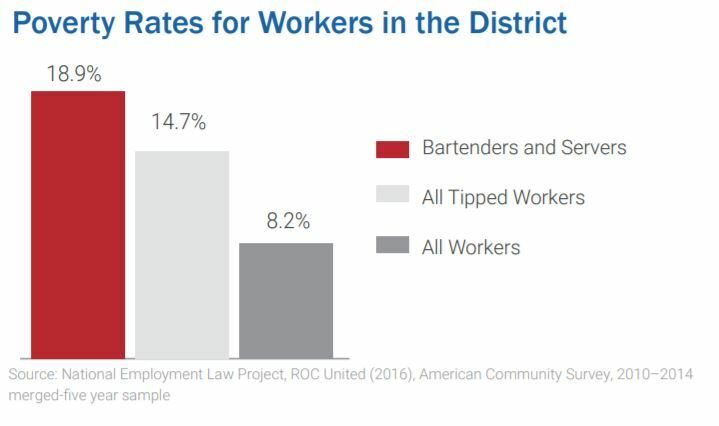 Yesterday, DC residents voted to pass ballot initiative 77, which will eliminate the sub-minimum wage for tipped workers, and create one fair wage for all workers in the District. So, what’s next you might ask? Good question! After certification and a 30-day congressional review period, the law will go into effect, gradually phasing out the subminimum wage until tipped employees receive the same minimum wage from their employers as other workers in the year 2025. While the DC Council and mayor have the power to overturn or amend initiatives through the legislative process, with 55 percent of the District voting for Initiative 77, DC Council should listen to the voices of DC residents and not move to block or water down the law. Like in all places, elections in DC are important—they allow all residents to voice what’s important to them and take action to shape their community. By voting yes on Initiative 77, DC residents have voted for predictable incomes, higher wages, and greater economic security for tipped workers in the District. Workers will no longer rely on tips for their income, and employers will be responsible for paying workers a full minimum wage. With one fair wage DC’s roughly 30,000 tipped workers will have a higher base wage, plus tips from patrons. Workers will no longer rely on customers for their wages, and tips will fill their intended purpose—a token of gratuity from a satisfied patron. One fair wage is good for workers and the city as a whole. And it is supported by a strong majority of DC residents, including majorities in Wards 1, 4, 5, 6, 7, and 8. Policymakers should respect the will of their constituents, and the evidence from other states, and commit to implementing Initiative 77 as passed.